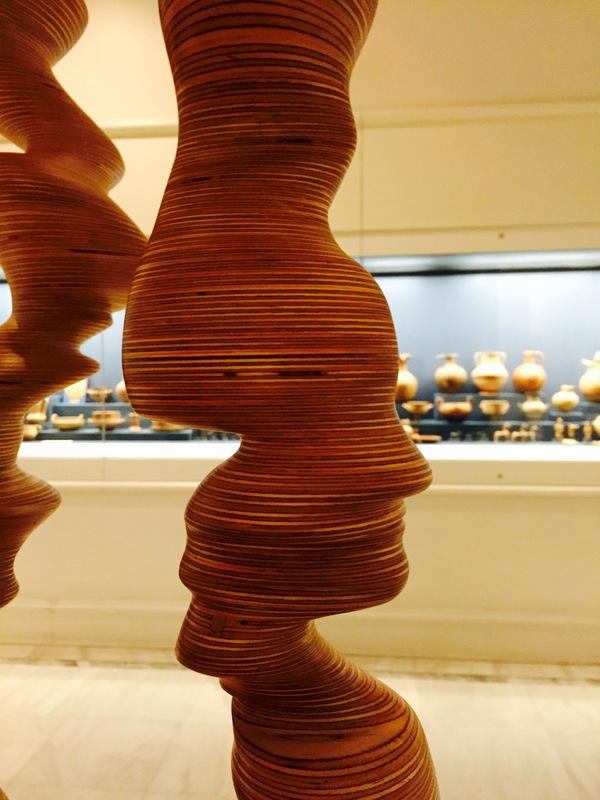 There is plenty of art on show in Athens these days. As well as the Documenta project, which is spread all over town, from May 26 to 28 there was also Art Athina, a three-day fair open to the public. Fifty eight galleries, mostly from Greece but quite a few from abroad (Paris, Istambul, Vienna, Zurich, and even as far away as Dubai, Australia and Mexico) offered modern art for sale in a wide range of prices. The fair was held at the Tae Kwon Do Stadium in Faliro, on the coast not far from the center of Athens, a venue built especially for the 2004 Athens Olympics. It is a modern and spacious structure benefiting from a wonderful location next to a marina full of yachts. Nowadays it is used for various purposes, such as concerts, and even provided shelter to refugees at the worst of the crisis. Inside, the galleries had set up their booths, and it was fun wandering around looking at the art on offer. Sadly, I was extremely dismayed, if not disgusted, by the state of the building’s interior. I decided not to post any photos, thinking it too depressing. But I was aghast at the unpainted, stained walls, the dirty floor, the missing or broken fixtures… I don’t understand how some funds could not be raised to at least freshen it up a little. The whole issue of the Olympic venues is shameful. Most have been left to rot – and when I think of what Greek taxpayers forked out for them (they were grossly overpriced) it makes me grind my teeth. What’s more, the labyrinthine governmental system means that any attempt at exploiting them is resisted. Apparently the National Shooting Federation wanted to take on the Olympic Shooting complex and keep it functioning and upkept, but their offer was refused. The racetrack and equestrian centre have become totally decrepit, despite racing being a potentially profitable business. Etc, etc. – and we are talking about state-of-the-art, modern installations that could benefit Greek athletes who usually have to train in less than ideal conditions. It beggars belief. I can only console myself with the thought that, thanks to the Olympics, we have at least got a new, very functional airport, a good subway and a much improved road system. These had been planned for over twenty years (!) but had never materialized and would not have been finished but for the games. Part of the problem being that, wherever you dig, you find antiquities, and work has to stop until the Archaeological Society decrees what is to be done. A couple of museums were filled with what was found on these sites – but that is another story! 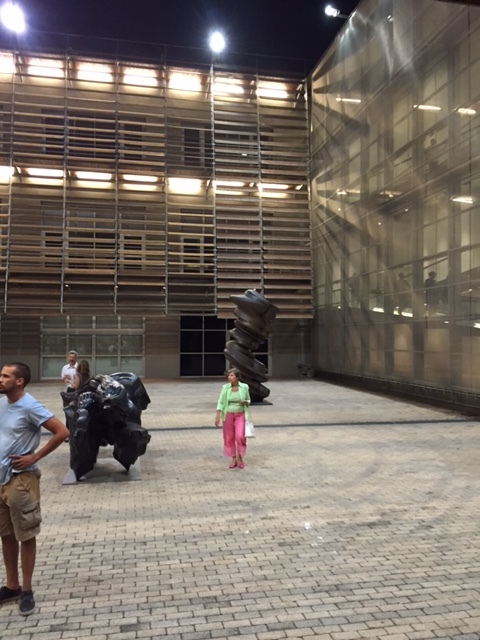 If you are interested in more detail about Art Athina, pop over to the Art in Athens blog, there is a very interesting article here. It’s a month to inspire people to paint with watercolor (watercolour, aquarelle) while raising awareness for the importance of art and creativity in the world. Anyone can join the celebration, from master watercolorists to artists just starting out with watercolor! Best of all, this first year of the celebration will be about raising awareness for children in need of art supplies and art education around the globe. Art is an important aspect of child development and paves the way for a successful future. What would the world be without art? Day 1: Sketch of flowers past their prime. The little girl standing next to me was counting faces. 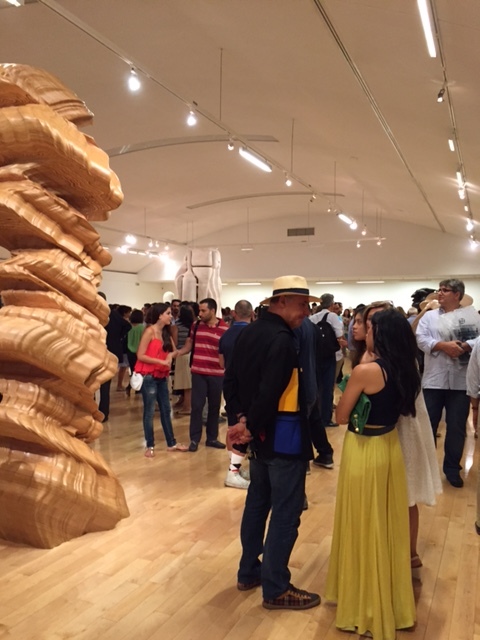 The sculpture before us was made of sheets of plywood glued together in layers. Three twisted pillars that reminded me of rock formations – or stalagmites (see photo on left). But as we circled it slowly, human profiles revealed themselves: some impassive, some stern, some faintly smiling. The little girl got excited, and so did I. If you look at the photo above, and the close-up below, you will see what I mean. This was one of the most deceptively simple, yet, upon inspection, incredibly complex pieces of art I’ve ever seen. When asked if some of the faces somehow ‘appear’ when he’s creating the piece, Tony Cragg is firm. Everything is meticulously planned. He takes pencil to paper and sketches out every facet of a new idea before converting it to 3D. Sometimes this proves impossible – his imagination has run away with him. Some ideas never evolve beyond the drawing stage, but if the drawings themselves are lovely, the completed sculptures are breathtaking. 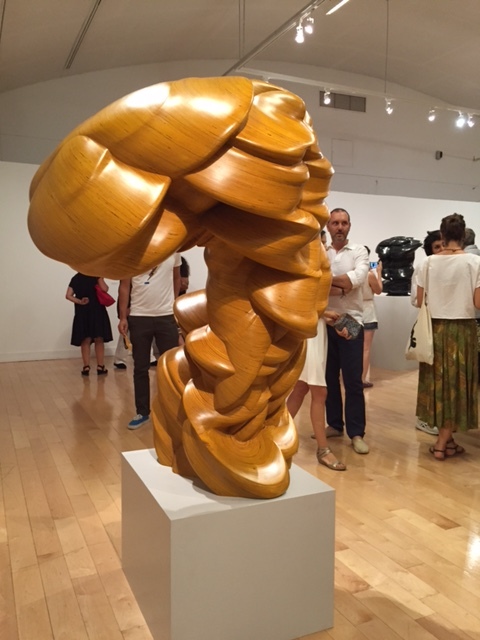 On September 8, a cosmopolitan and mostly young crowd gathered at the Benaki Museum for the opening of Tony Cragg’s sculpture exhibition. Cragg, 66, born in Liverpool, winner of the prestigious Turner Prize in 1988, has never shown his work in Greece before. He appeared happy to explain his thought processes as he stood in the auditorium, looking relaxed in an open-necked shirt. The audience enjoyed his engaging narrative which was accompanied by a slide show, and afterwards plied him with questions and requests to sign their catalogues. Wandering amongst the works after the talk, my overwhelming urge was to touch them. Their curved, smooth surfaces cried out to be stroked. Cragg uses natural materials such as wood, polished stone and bronze as well as mirror-finish steel and even plastic. The sculptures are very different. Some are squat and grounded. Some seem to be leaning into the wind, their surface eroded into the outlines of human profiles. Others soar upwards. Yet they all emit the same energy, their shapes shifting depending on where you’re standing. As I was leaving, I stopped to admire a few of the bigger bronze sculptures dotted about the museum’s wonderful courtyard. The exhibition was curated by Xenia Geroulanou of the Thaddaeus Ropac Gallery, who has represented the artist for 20 years; the Benaki Museum; and the artist himself, who loaned all the works from his own foundation. 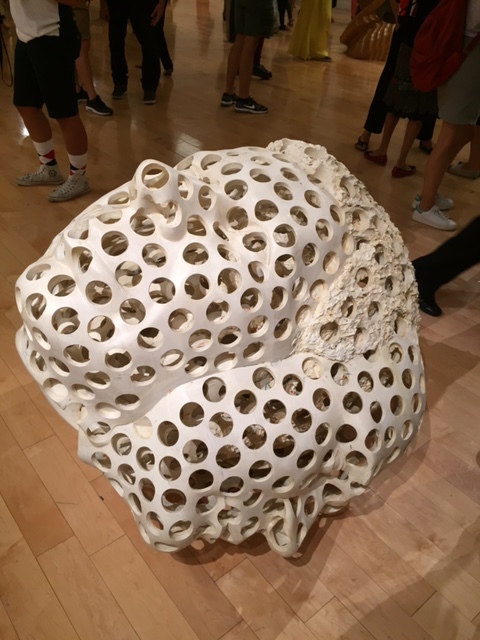 *For anyone interested, below is the link to an article about Tony Cragg written by Vanessa Wildenstein for Athens Insider Magazine. 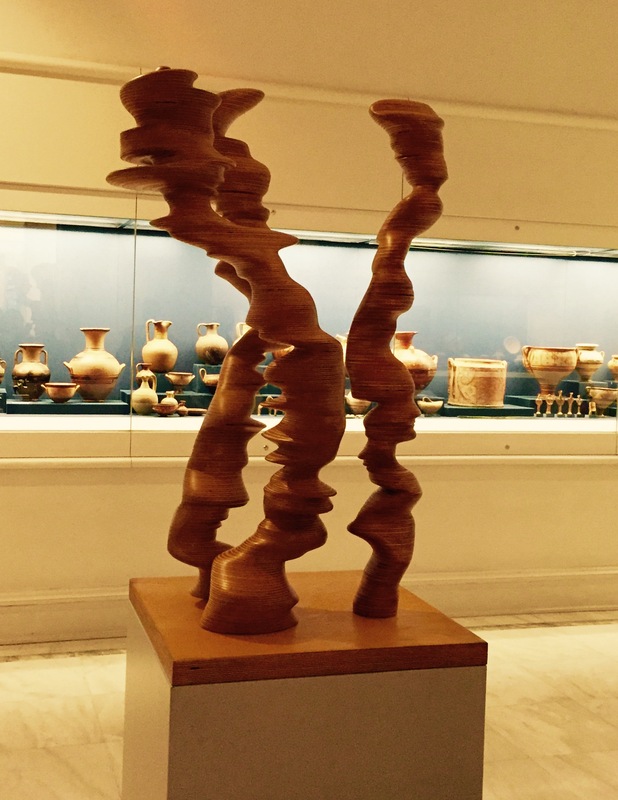 *For those in Athens, the exhibition runs until November 8, 2015. Opening hours are Thursdays and Sundays from 10 a.m. to 6 p.m. and Fridays and Saturdays from 10 a.m. to 10 p.m.